Christmas Wreath Fingerprint Art Cards – Make handmade Christmas cards with your kids this year! Invite the kids to use their fingertips to make fingerprint Christmas cards with this easy Christmas wreath template hack. Friends and family love homemade Christmas cards from the kids! Make fingerprint wreath Christmas cards this year. 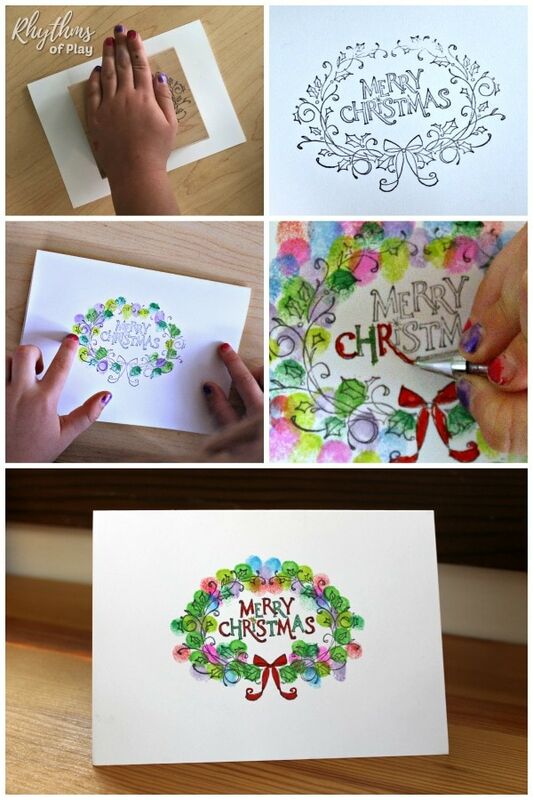 Creating Christmas fingerprint art is easy with this trick. Instead of drawing wreaths over and over again to use as a template for your kids’ fingerprints, try this easy Christmas card hack instead! If the thought of drawing wreaths over and over again to make wreaths is overwhelming to you, this is the Christmas card hack for you. This simple step makes it a whole lot easier to make Christmas wreaths to use as a template for your children’s fingerprints! 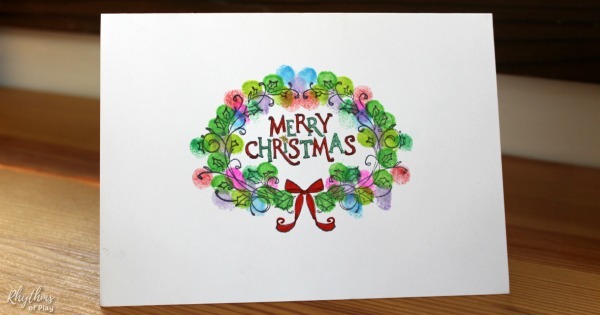 Simply press the Christmas wreath stamp into the large black ink pad and stamp it onto the front of your blank greeting card . Repeat as necessary. Make Christmas fingerprint art! Invite the kids to use their fingertips to decorate the wreath for each Christmas card using fingerprint ink pads . Use gel pens or extra fine tip permanent markers to fill in the “Merry Christmas” portion of the Christmas wreath template. Family and friends love receiving handmade cards and gifts from the kids. Have a look at our collection of homemade gift ideas kids can make for more ideas! 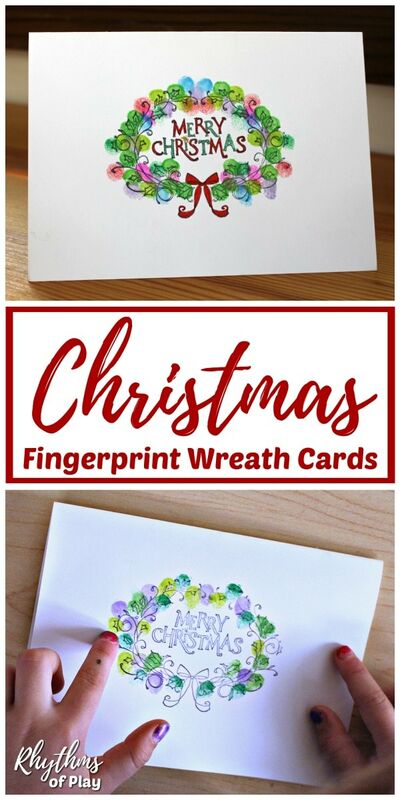 This simple Christmas fingerprint art hack makes it super easy to make fingerprint wreath Christmas cards to send off to your friends and family. Try it today! Be sure to check out 27 fun family Christmas traditions for a magical holiday for more ideas.